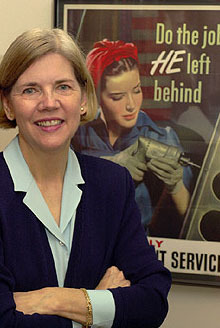 Warren has an exceptional track record as an intellectual and as a public spokeswoman. But those are only a small slice of the responsibilities of an agency head. The leader of the new consumer financial protection bureau will need to hire hundreds, maybe even thousands of people, create an administrative structure from scratch, and oversee what is likely to be a long and arduous process of writing regulations that will govern millions of transactions. He or she will need to be sufficiently savvy in the inter-agency rulemaking process to avoid getting rolled by other regulators, particularly Sheila Bair at the FDIC and a newly named vice-chair for supervision at the Federal Reserve. Then there’s the more basic task of maintaining good relationships in the White House and on Capitol Hill. Looking at Warren’s CV, it appears that her current job, as chair of the Congressional Oversight Panel, is her most extensive experience in or around government (she has also served on the FDIC’s Committee on Economic Inclusion, among other advisory roles). She may well be an extraordinary manager who can finesse the policymaking process and who would have as deft a touch at managing an agency’s internal politics as she is at managing her public profile. But given that she doesn’t have that experience — or much policymaking experience at all — on her resume, the burden of proof will likely be on she and her allies to make that case. I’m not really sure how you make a judgment about this. It’s a serious issue, since starting up and running a big government bureaucracy is something that requires a very specific kind of administrative talent. But how do you know if someone who lacks previous managerial experience is likely to make a good manager? Obviously, a personal interview as well as references from people who know her would be a big part of it. Beyond that, I think my take is that I’d choose Warren but insist that she hire a couple of very experienced, very DC-savvy deputies. That’s a combination that often works well. Via Ezra Klein, who notes that Irwin also mentions the possibility that Warren could end up being too much of a consumer protection crusader. Given the institutional pressures working in the opposite direction, though, I doubt very much that this is a big issue.